Posted on April 01, 2018. SINGAPORE – Two parallel import car dealers have shuttered without notice, leaving customers who have paid a total of some $300,000 in deposits in limbo. “Consumers who suspect that fraud is involved should report such cases to the police,” Case said in a notice on its website. Both showrooms were closed when The Straits Times visited them last week. 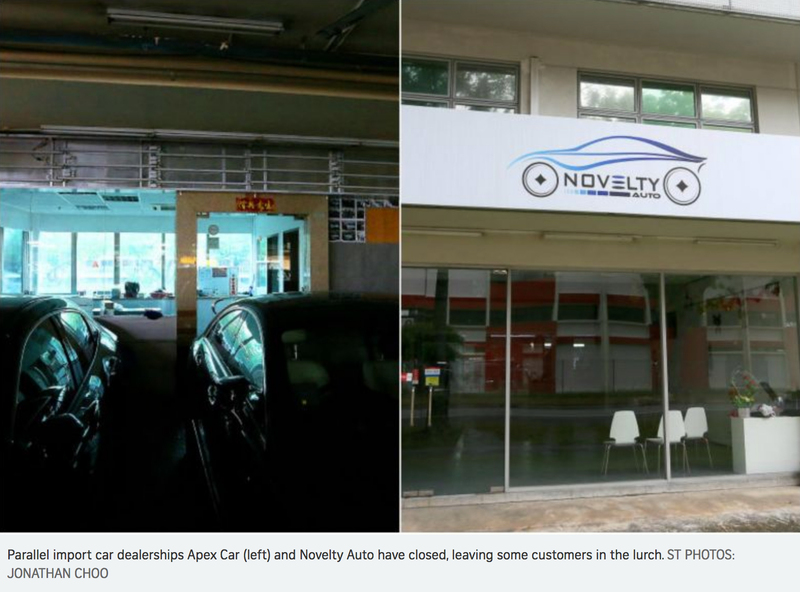 The signboard of Novelty Auto hung above an empty showroom, while little trace of Apex Car remained – its signboard has been removed, leaving just a faded red Chinese New Year banner that read “prosperity in business” above its locked glass door. The company, which has been in business since 2010, has a paid-up capital of $10,000. It claims on its still working website that it is one of Singapore’s top parallel car importers. The website also has a logo of the “Top 100 small and medium-sized enterprises award” from the little-known Singapore Enterprise Association, a private company with a paid-up capital of $100, which organises events. Apex Car’s sudden closure has caused problems to not just its customers, but also Apex Trading, another car dealer with a similar sounding name, which has a showroom just several doors away. While some of the closures could be a result of business failures, two of these were two high-profile criminal cases. In 2016, Poh Chee Tiong, the boss of Cars Today, was jailed seven years for cheating 71 buyers, 14 sellers and four finance companies of a total of $3.16 million in money and cars. Case executive director Loy York Jiun advised those drawn to cheaper parallel import cars to be wary when prices are too good to be true. “Always negotiate to pay as low a deposit as possible upon signing the contract. Do not make full payment upfront to the parallel importer,” he added.